The second edition of the Invitational Team Racing Challenge regatta in Porto Cervo, Italy concluded with a resounding victory for California’s Newport Harbor Yacht Club. Wind Water Realty's Vice President, Rob Rader is a member of that victory team. Over the course of three day’s racing (June 16-18), organized by the Yacht Club Costa Smeralda, the participating teams completed a total of 62 matches in varied sea and wind conditions. The team flying the Newport Harbor burgee, together with the crews from New York Yacht Club and Marblehead’s Eastern Yacht Club, proved to be strong contenders from the off. While NYYC racked up a perfect scorecard in the first day’s Round Robin, winning 5 out 5 races, Newport Harbor YC managed to consistently win each one of their races in the Round Robins of days two and three. 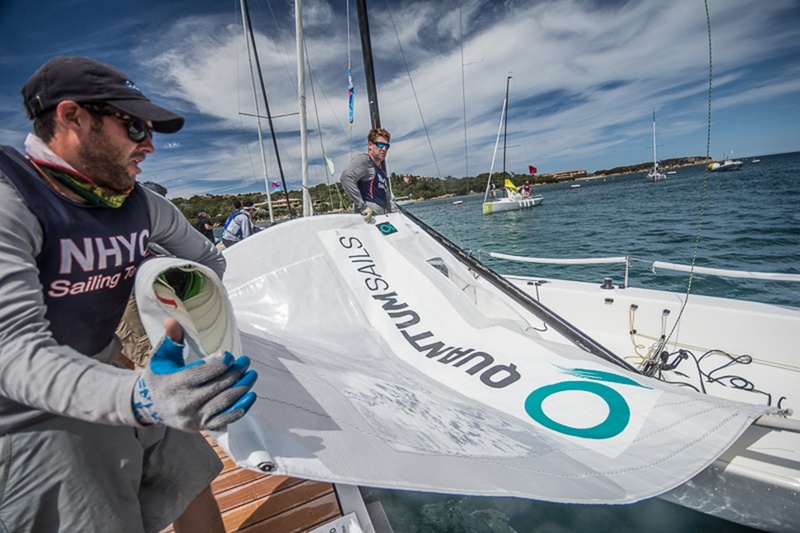 Rob Rader (pictured on right), competes at team racing invitational in Porto Cervo, Italy. The battle to attain second position overall – and consequently a place in the final knock-out round – was fought between New York YC and Eastern Yacht Club. However, after a lackluster performance in the final Round Robin from the New York team, it was Eastern that pipped their USA counterparts to the post by just one point. The final, which took place in 15 knots of Mistral breeze accompanied by warm sunshine, once again saw Newport Harbor dominate as they immediately tucked away two wins in the best-of-three competition. The final leaderboard therefore sees an all-American top three with Newport Harbor YC followed by Eastern YC in second and New York Yacht Club in third place. The team representing host club YCCS claims fourth place ahead of Royal Thames Yacht Club and Gamla Stans YC of Sweden. The event was held in the new J70 fleet of the YCCS. Each club participates with a team of two crews of three people with a total of eight Clubs will be represented. Article published by the Scuttlebutt Sailing News. Click here to see event pictures.